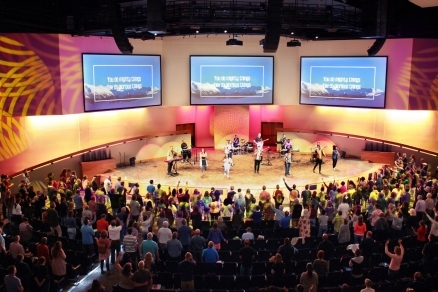 The Men’s Advance 2019, March 14-16, will be our first Men’s Advance in our brand new Auditorium at our Main Campus in scenic Woodland Park, Colorado! Woodland Park is a beautiful mountain community, nestled beneath exquisite views of Pikes Peak, approximately 25 minutes northwest of Colorado Springs. The “mountain life” is the perfect place for hiking, camping, fishing, hunting, skiing, mountain biking, or just taking in God’s breathtaking creation! At this year’s conference, you’ll learn what it means to champion your faith, deepen your relationship with the Lord, and build lasting bonds with other great men of God through fellowship. This event is now FREE! A $40 meal ticket is available for purchase if desired and includes one lunch and one dinner. There will be food vendors on site, hiking trails and many other free activities. This is your opportunity to champion your faith, train for leadership, and become the leader God created you to be! This event is now FREE! A $40 meal ticket is available for purchase if desired and includes one lunch and one dinner. Tony Dungy led the Indianapolis Colts to Super Bowl victory on February 4, 2007, the first such win for an African American head coach. He established another NFL first by leading his teams to the playoffs for ten consecutive years. Dungy joined the Colts in 2002 after serving as the most successful head coach in Tampa Bay Buccaneers history. He previously held assistant coaching positions with the University of Minnesota, Pittsburgh Steelers, Kansas City Chiefs and Minnesota Vikings. Before becoming an assistant coach, Dungy played three seasons in the NFL and won the Super Bowl as a member of the 1978 Pittsburgh Steelers. Dungy has been involved in a wide variety of charitable organizations, including the Fellowship of Christian Athletes, Athletes in Action, Mentors for Life, Big Brothers Big Sisters, Boys & Girls Clubs, the Prison Crusade Ministry, and All Pro Dad. He also served on President George W. Bush’s Council on Service and Civic Participation. Tony and his wife, Lauren, head up the Dungy Family Foundation, a non-profit organization they founded with the goal of strengthening communities by helping those in need. Dungy is the New York Times bestselling author of Quiet Strength and Uncommon: Finding Your Path to Significance. His latest book is Mentor Leader, another New York Times best seller. He retired from coaching in 2009 and now serves as an analyst for NBC’s Football Night in America. Tony and his wife, Lauren Dungy, are the proud parents of ten children. In an effort to better serve our guests, Charis now offers a new opportunity for on-site refreshments using the Yoke Payments app. By installing this app on your smartphone, and adding funds ahead of time, you can easily pre-pay for snacks and beverages at all of our events without needing to stand in line. Download and install the app ahead of time by searching "Yoke Payments" in your smartphone's app store (available for iOS and Android), and be ready to enjoy.